FUJIFILM North America Corporation, Graphic Systems Division announces the Inca SpyderX, a flexible and powerful flatbed and roll-to-roll UV inkjet press; making its North American debut at the upcoming SGIA Expo 2017, October 10 through 12, in New Orleans, Louisiana. The SpyderX is a powerful and versatile printer that produces a wide variety of output. Using the Fujifilm Uvijet XS ink system developed specifically for the SpyderX, it delivers high-speed production up to 2,476 square feet per hour (230 square meters per hour) with pinpoint accuracy. Utilizing Inca’s in-depth knowledge of core inkjet technologies along with Fujifilm’s market experience, Dimatix printheads and Uvijet ink, SpyderX opens the door to application expansion or short-run specialty work support for print service providers. 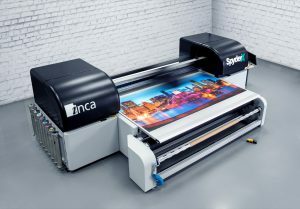 Designed and manufactured by Inca Digital, the SpyderX platform incorporates state-of-the-art technology, including FUJIFILM Dimatix printheads, and Fujifilm Uvijet ink. The robust 126” (3.2 m) wide, six-color plus white SpyderX is available as either a flatbed or a combination flatbed/roll-fed model, for handling rigid and flexible substrates, including PVC sheets, foam board, corrugated, polystyrene, window cling, wallpaper and banner material. SpyderX allows for both rigid and flexible printing resulting in a wide variety of applications from menu boards to banners to back lit signs and permanent indoor displays. And with SpyderX including light inks (Light Cyan and Light Magenta) in the standard channel configuration, it allows for finished prints with smooth tones and gradients while still printing at remarkable speeds. The SpyderX standard configuration also includes two white ink channels. The addition of white ink allows for printing on clear and dark substrates, as well as layered printing over or under an image, or it can be used as a spot color. And with Inca software, multi-layer images can easily be built within the printer’s User Interface, maximizing throughput on even the highest quality specialty graphics production. Since 2001, Inca Digital and Fujifilm have collaborated to bring best in class solutions to the sign and display market, with Fujifilm being the exclusive North American distributor. Be sure to visit Fujifilm at booth # 1529 at SGIA Expo 2017 to learn more about their new and innovative solutions. To learn more about Inca Digital, please visit: www.IncaDigital.com.